Once upon a time, long long ago, two people (that will be us of course) decided to leave the shores of South Africa to see what other cultures are all about. We both left SA (before we knew each other) and went to London where our paths would cross and we would eventually get married in South Africa in 2000. After putting up with the foul weather in England for close to 10 years for Jacques and almost 7 years for Mandy it was time to move on and find a bit of sunshone again. After all, they do say that a bit of sunshine keep the spirits up. We did manage to see a fair bit of Europe before we left, and also managed to travel through parts of South East Asia eg Sri Lanka, Thailand and all those nice places. 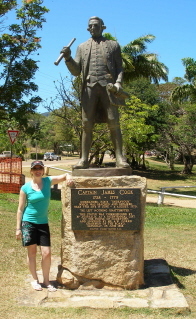 We finally arrived in sunny Australia mid 2006. When we got to Australia we wanted to do something different, so what better way than to get a capable 4 wheel drive and to start exploring this very big country. 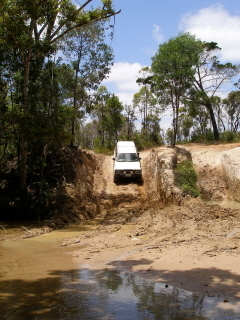 The vehicle of choice was a Toyota Hilux (3.0 litre diesel) Double Cab. A new fourby obviously needs a new name, and after thinking about it for some time, we decided to call it Pumbaa I. After doing some planning and prep work, we took off on an amazing trip from Brisbane right to the most northern point of Australia, then across to Darwin and down through the middle of Australia to the most southern tip and then back round to Sydney. 24,000km later we found ourselves back in Sydney where we settled for a bit before we head off again. 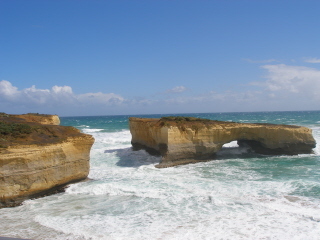 We thought we would add a few photos of our Australian trip here...just to get you in the mood...Enjoy!!!! 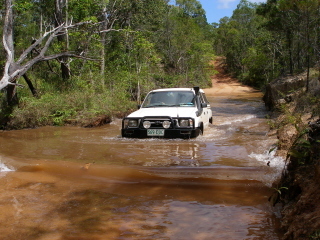 One of the many challenging sections we had on the Old Telegraph Track in Cape York. Here is a shot of Pumbaa I attempting the notorious gunshot creek. This is meant to be one of the more difficult sections to tackle on the way up to the Top, but Pumbaa I managed it very well. It would've been a different story though if it had been raining a couple of days before we got here. We also decided to tackle it on the way up instead of on the way back because it is a lot easier getting stuck going the other way due to the steep inclines. The main problem with this crossing was that there was lots and lots of sticky clay so Jacques had to slowly move down the hill and then 'give it some gas' to keep the momentum up in the mud so that he didn't get stuck. We made it! Us at the very northern Tip of Australia with our good friends Cal & Katie. It was a wonderful feeling being there that day - there was no one else about so we really felt like we were almost at the edge of the earth. Pumbaa I going for a swim - there were quite a few of these crossings on the trip, luckily we made it through all of them without too much trouble. After a long day's driving it's always nice to relax with a cold drink! 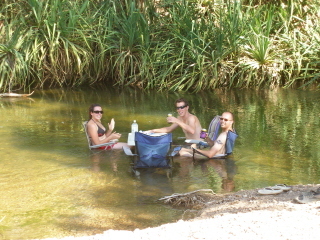 This was a beautiful little spot where we camped in a very dry, hot river bed and enjoyed a game of scrabble in the river! 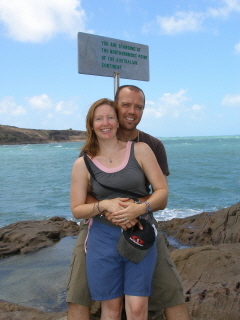 After Cal and Katie left us to head down south (back to Victoria) we headed up north towards Kakadu. 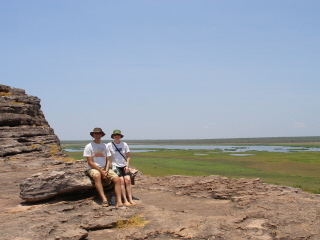 In this photo we are in the national park with an amazing view of the wet lands towards Arnhem Land. The day was perfect, although it was propably one of the hottest days on our trip. 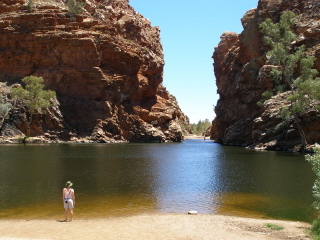 It was at least around the early 40 deg c.
The beautiful MacDonalds ranges. This is just a bit (about 200km) east of Alice Springs towards Uluru - the water looked very inviting that day, but it was extremely cold! Yikes!! Snakes! 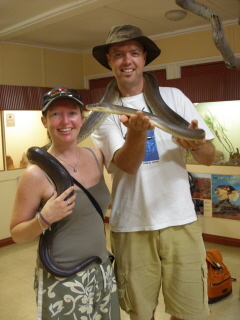 This is us at a small but very interesting reptile park in Alice Springs - getting aquainted with the locals! The Rock - what an amazing place - we couldn't believe that we were actually there at the rock! It seemed so unreal at the time. 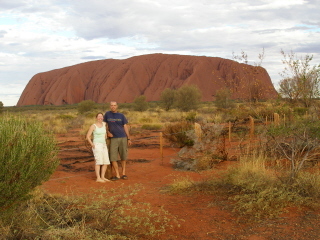 Make sure you go to The Olgas as well if you are ever in the area. Also very nice. Aah, the great ocean road - it was a beautiful drive along this stretch of the Victorian coast line, with amanzing views of the rocks and formations. This one is called London Bridge. It was connected up to a few years ago before the bit in the middle collapsed. 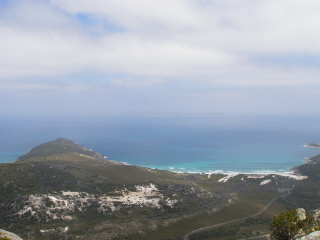 The west proms is a big national park and is the southern most tip of Australia. definitely a bit cooler that the north which is nice. we also managed to see all but 12 or 13 koala in the wild in Cape Conway National Park which is close to west proms. We even had a few in our camp site (fd04).